short girl, long island. : Blogger Craft Night! Last night, I met up with Sarina, the gal behind the awesome blog, Nerd Craft Librarian. Now, we were both connected in numerous ways, but hadn't officially met until yesterday. Sarina went to high school with my brother, Vinnie, and I went to kindergarten with her brother, Charlie. Also an interesting fact: in kindergarten, I tried kissing Charlie on the school bus (I was very forward, even at the tender age of five). The bus stopped short and Charlie fell, which gave him a pretty gnarly gash, and I'm pretty sure he had to get stitches. At his birthday party, which I want to say was at a bowling alley (I'm trying to remember 25 years ago, so bear with me), I was saying goodbye and I was afraid to hug him (I hugged all of my friends, and actually contracted mono from a girl I hugged who bit my face. No bath salts, just a girl who hated hugs), but our moms said I wouldn't hurt him by hugging him. We hit it off right away, and Sarina gave me a tour of their awesome new house before we got to work in the craft room. Yes, she has a craft room, and it rules. I had brought over supplies to make tile coasters, and Sarina was going to teach me the ways of using freezer paper to make a stencil for a tote bag I had. Our first project we embarked on were the coasters. Here is a quick tutorial on how we did this. 1. Cut felt to be a bit smaller than your tile - don't want overhang. Glue to bottom of coaster BEFORE decorating. I did it after I started. It wasn't the end of the world, but it is wiser to get this taken care of first. 2. Figure out what you want to put on the coaster, paper/fabric-wise first. Lay the items out on the tile, before applying Mod Podge, so you can see if you like the layout. 3. 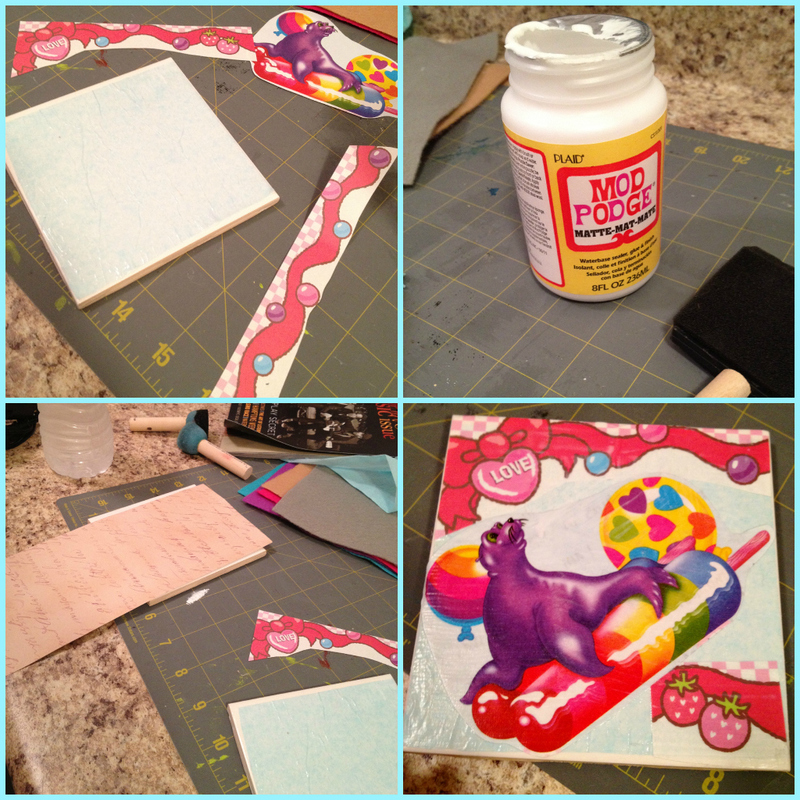 Apply a thin coat of Mod Podge onto the tile with your foam brush, and start placing the paper on. Smooth down with your fingers. Once all of your pieces are on, apply a thin coat of Mod Podge on top. Let dry for 10-15 minutes. Repeat process twice. 4. Wait a few hours (or overnight, like I do), and use an acrylic sealer. It will make the coaster last longer, because the Mod Podge won't protect from water damage. Follow the directions on the sealer bottle, and apply at least three coats to your coasters. On my last batch, I applied half a dozen coats of sealer, over the course of two days. I'd rather be safe than sorry, especially since these will be used as gifts! Regarding the freezer paper, Sarina be posting a tutorial soon, so make sure you bookmark her blog. If you want to see a larger step-by-step photos of her latest Halloween themed freezer paper project, click here. I'll tell you this, though - it was simple and awesome. Check out the bag I created below! We took a crafting break, and my gracious host fed my hungry little behind homemade doughnut holes and Caprese salad, while we discussed our next crafting escapade. I seriously had so much fun last night. It was the first time I've actually hung out with a fellow blogger - crazy, right? But we definitely have more blogging and crafting projects up our sleeves for the future. I also had to post this for you Dr. Who lovers out there. Sarina made this amazing TARDIS bag, which will be up in her Etsy store shortly. Do any of you often have blogger meetups or crafting nights? If any bloggers on the island are reading this, let us know if you're interested in either. Its always fun meeting new people and making fun creations. I've never gotten into either show. The last show I watched on a regular basis was LOST. I've met one blogger in real life a while ago when I lived in Baltimore. He was lovely, normal, and fun! I've also met up with some happening Twitter peeps in DC and they were equally great! Craft night was so much fun! I look forward to more crafting adventures. Also Michele growing up I always heard that story of some one trying to kiss my brother on the bus... I had no idea it was you lol. Yup, that was me! :) Definitely another craft night soon. I knew you'd love the LF! This is such a fun idea! What a great way to meet new people and try out those crafts that are on your wish list. Thanks for the tutorials and ideas!